Limiting magnitude is a quick method of assessing sky quality for darkness by sampling various regions of the sky and simply counting the number of stars one can see in each region. The method will produce different results for each individual, thus it’s also a gross or general assessment of individual visual acuity. We assess they sky at evening twilight as the stars appear. We also give a brief historical overview of visual magnitude as a measure of brightness and how it applies to celestial objects. Howard’s interest in the sky sprouted in childhood, but grew and branched into active passions throughout his life. He became a commercial pilot and FAA flight instructor in his thirties and conducted search and rescue missions in his forties. One evening while serving as an instructor at a mountain flying clinic in Lakeview, OR, he saw the night sky from the ramp and was inspired to pursue astronomy. Since then he’s become active in the astronomy community in Portland. After retiring in 2005 he started his encore career as an astronomy instructor at Concordia University. In 2008 he and his wife Darla spent part of the summer doing astronomy outreach at Chaco Canyon, NM. 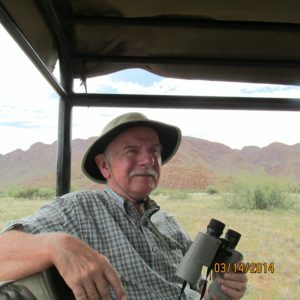 In 2014 he traveled to Africa to be resident astronomer at Sossusvlei Desert Lodge in Namibia..